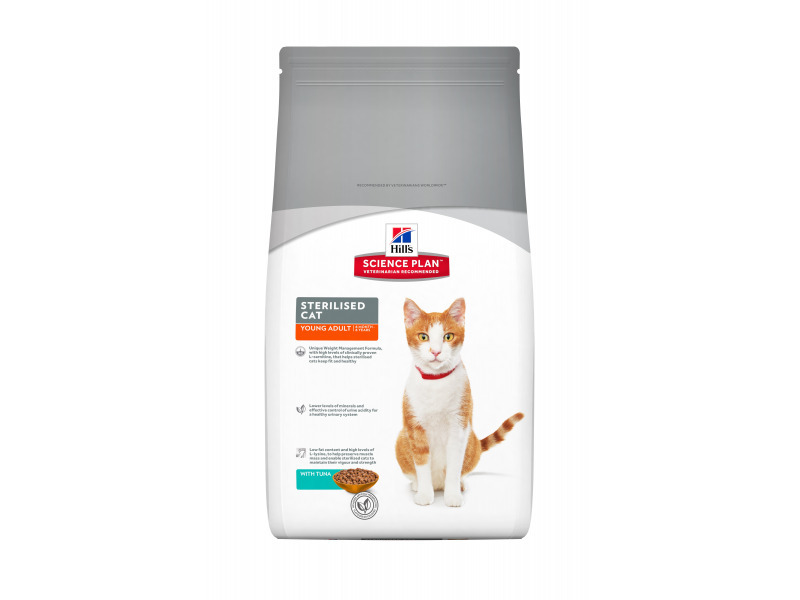 Optimally balanced Hill's nutrition to keep neutered cats from 6 months to 6 years fit and healthy, day by day, with L-carnitine and L-lysine to maintain ideal weight. 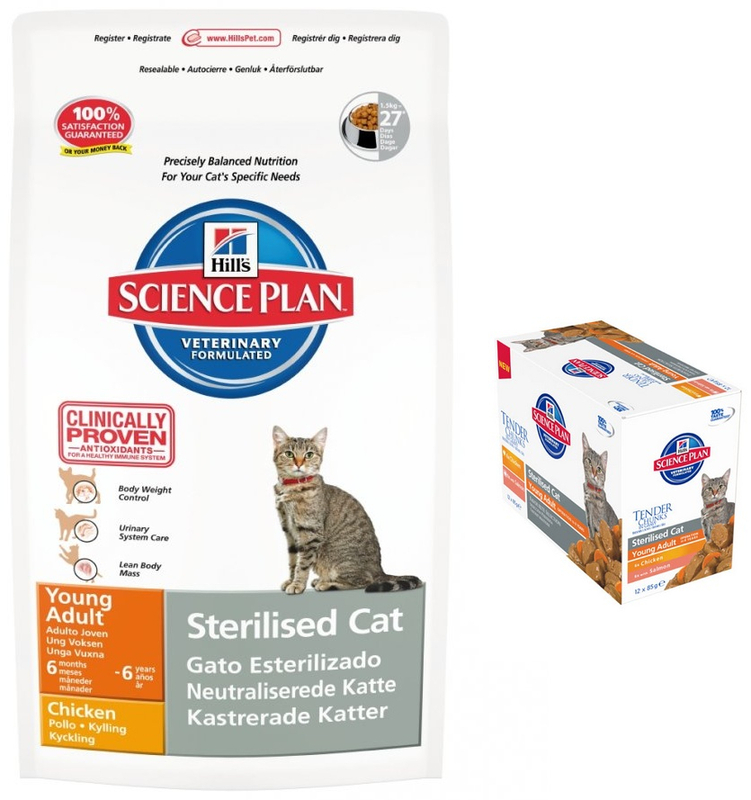 Hill's Science Plan Feline Young Adult Sterilised Cat Chicken is an optimally adjusted cat food for neutered cats from 6 months to 6 years. Many cat owners have their cat neutered to avoid pregnancy and certain undesirable behaviours. On the downside, neutering increases the risk of becoming overweight and developing bladder stones threefold. Overweight can in turn lead to serious health problems such as diabetes mellitus. The required feeding amounts may vary according to age, temperament and activity levels. Chicken (32%): Maize, poultry meat meal, maize gluten meal, animal fat, fish oil, digest, potassium chloride, salt, calcium carbonate. Ingredients: Tuna: Maize, chicken and turkey meal, maize gluten meal, tuna meal (9%), animal fat, minerals, L-lysine, digest, fish oil, flaxseed, L-carnitine, taurine, vitamins, trace elements and beta-carotene. With a natural antioxidant (mixed tocopherols). Ingredients: Chicken: Maize, chicken (36%) and turkey meal, maize gluten meal, animal fat, minerals, fish oil, L-lysine, digest, L-carnitine, taurine, vitamins, trace elements and beta-carotene. With a natural antioxidant (mixed tocopherols). Salmon - Meat and animal derivatives, cereals, fish and fish by-products, vegetable protein extracts, derivatives of vegetable origin, sugar, minerals, vegetables, eggs and egg products, oils and fats. - Chicken: Chicken (24%), pork, maize starch, various sugars, dried egg white, wheat flour, tomato pomace, pea protein, cellulose, minerals, coconut oil, flaxseed oil, fish oil, dried carrots, dried pork protein, vitamins, trace elements, taurine and beta-carotene. Coloured with natural caramel. - Salmon: Chicken, pork, salmon (4%), maize starch, dried egg white, pea protein, tomato pomace, various sugars, cellulose, wheat flour, minerals, coconut oil, flaxseed oil, dried carrots, dried pork protein, vitamins, trace elements, taurine, fish oil and beta-carotene. Coloured with natural caramel. Protein (7.6%), fat (2.2%), fibre (1.1%), ash (1.3%), moisture (80.0%), calcium (0.20%), phosphorus (0.16%), sodium (0.07%), magnesium (0.018%), vitamin E (130 mg/kg), vitamin C (20 mg/kg), beta-carotene (0.3 mg/kg). Contains Hill’s™ WMF™ (Weight Management Formula™). Young neutered adult cats of either gender, from 6 months - 6 years old. Kittens under 6 months old. There are currently no questions for Hills Science Plan Young Adult Sterilised Cat Food - be the first to ask one!